Summary: At the edge of a woods, on the grounds of a defunct “free school,” Ava and her brother, Fred, shared a dreamy and seemingly idyllic childhood—a world defined largely by their imaginations and each other’s presence. Everyone is aware of Fred’s oddness or vague impairment, but his parents’ fierce disapproval of labels keeps him free of evaluation or intervention, and constantly at Ava’s side. 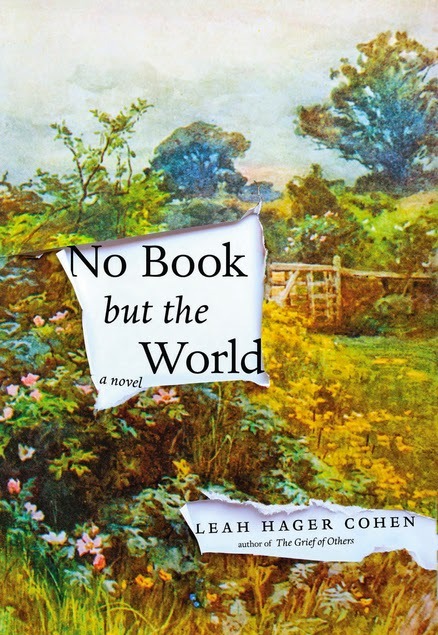 My friend Dawn rarely raves about a book, so when I saw her post something on Facebook about the new novel NO BOOK BUT THE WORLD by Lean Hager Cohen, I knew I had to read it. I requested this book immediately from our local library, and it took weeks for it to arrive. When it did, I rushed right over and started reading it right away. I actually ended up finishing it that very same day too! You might think that when I had such high expectations for a book that I was just asking for trouble; however, that wasn't the case with NO BOOK BUT THE WORLD. I was caught up in this story from the first few pages and I didn't put it down until I finished it. It was so beautifully written and the characters were so intriguing that it just captured my heart! NO BOOK BUT THE WORLD tells the story of Ava and her brother Fred. They lived in a rural environment on the campus of the closed "free school" that their father ran before they were born. They are pretty much left free to learn about the world and their environment on their own, but they do have some interactions with the other families that live at the school. Fred is a little peculiar and not a great communicator, but his parents refuse to label him or have him evaluated. As a result, he is very close to Ava with little contact with others. As the children grow older and their parents die, Ava and Fred lose contact with each other. Ava marries her best friend's brother who used to live at the school, and Fred becomes a bit of a drifter. When Ava learns that Fred is in jail for a horrific crime involving a young boy, she rushes to his side to learn the truth because she believes she is the only one who can get through to him. NO BOOK BUT THE WORLD is a very special book and one that will remain in my thoughts for some time. It is the first novel I've read by Ms. Hager Cohen and I admit I was blown away by her prose. The story is told in a variety of characters' viewpoints, and I loved how she captured the essence of them in each section. The story begins with Ava's story and her descriptions of the children's past are just so finely written with exquisite details. I was very impressed! And then, she switched to other characters' stories and I thought they were excellent. Finally, she told Fred's story and I think it was my absolute favorite version. So much about this story caused me to think.. and feel. I loved how well drawn the characters were and my heart went out to Ava. While I was intrigued by her childhood, I'm not sure I would have wanted to have so much freedom (and lack of structure.) And then to have to face that your brother (who isn't really able to communicate) might be a murderer is just heartbreaking. However, it was the stories about Fred that truly affected me. There is a story where Ava and her friend play with Fred that I found so sad and almost cruel. And the entire section of Fred's story just made me sick. His inability to understand normal interactions with people, his feelings of isolation, and the general way he was treated just made me cry. I can't even describe how much pain was conveyed through Ms. Hager Cohen's writing. Finally, I should say that this book had a bit of a surprise ending -- one that I definitely didn't see coming. It was revealed almost quietly and I had to read it twice to truly understand what happened. I was just so blindsided by it. This revelation actually made the book that much better to me (and keep in mind I was already loving it!) Everything just worked for me! Naturally, I'm going to say that NO BOOK BUT THE WORLD would make a wonderful book club selection. There truly is so much to discuss include family dynamics, education, philosophies on child rearing, marriage, obligation, autism, friendship, bullying, secrets, and discovering the truth. This is one of those books that you finish and want to call a friend to talk about what happened. I am so grateful that Dawn put NO BOOK BUT THE WORLD on my radar. It was such a beautiful book! Highly recommended for fans of literary fiction. I love surprise endings! Since both you and Dawn recommend this book, I feel like I have to try it! Wow this sounds great! The word "book" in a title always gets me! You've made me curious about this one. I'm going to add it to my never ending list! This does sound good, and I generally trust Dawn's recommendations. I'm so glad you enjoyed this as much as I did, Julie! I really liked the way the author wove in some of the philosophy/beliefs of the "free school" movement, and the story made me think a lot about the pros/cons of the testing and labeling that kids go through.